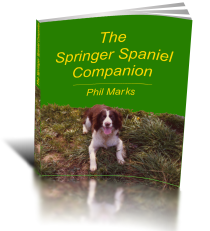 Simply, springer spaniels rescue dogs are springers which have been abandoned – either in the street and then captured by a Dog Warden and taken to a pound, or have been handed in to a Dog Rescue Centre as they are no longer wanted. Taking on a springer spaniels rescue dog requires careful thought and preparation. You may find that you will be carefully interviewed and assessed by the rescue organisation before you are allowed to adopt a dog. So, there are several things you need to consider carefully in preparation for the trip to the rescue center. This will ensure that when you take that dog home, it is the right dog for you and yours is the right home and family for that particular springer spaniel. What is a Springer Spaniels Rescue Centre? Usually a kennel run by a charitable organisation, though there are still local authority or city (dog catcher) pounds. Life expectancy for dogs is short in such pounds, and hence charities have grown. There are rescue centres which specialise in Springer Spaniels. These are just a sample of the reasons why a dog is given up to rescue. Some rescue organisations actually expect you to enter into a contract with them, and this may permit them to take the dog back if they are unhappy in any way with its treatment. Generally, most charitable rescue centres will be able to give you a health report on a dog, if only verbally. Depending on cost then the dog may be undergoing treatment at the centre. If you are looking for a dog to breed from or to show, then a rescue dog is not really an option. Most do not have the pedigree registration paperwork that is necessary and some rescue centres prohibit using the dog for breeding or for profit, even if the paperwork is available. Springer spaniels rescue dogs may not have been trained properly, or perhaps not trained at all and could therefore present a challenge; their background is usually an unknown. If they have come from a difficult or abusive family, then they may have behavioural problems, but the rescue centre should be able to advise you about this. If you can find a local rescue centre which specialises in the breed, then this is a clear advantage. Dogs are more likely to have come from good backgrounds with owners who care and are therefore seeking, for good reasons, to have the dogs placed in good homes via a specialist rescue centre. A really good pedigree Springer Spaniel will cost several hundred dollars from a reputable registered breeder; charity rescue centers cost money to run. So, if you have found the perfect springer spaniel for you at a rescue center, then at least give them a reasonable donation to help with their ongoing rescue work. You have saved one dog, help them to save more! I have had the joy of rescuing an English Springer Spaniel from a police pound and we were together for many years. He was well balanced, intelligent, great fun and a loyal companion. I would definitely recommend it as a course of action if your circumstances are suitable.